The issue here seems to be the term “flat cake”. It comes from “vnnd wen jr den platz gemacht hand”. Platz can be translated a few ways but one of them is a thin cake. A great mennonite dish, Platz, is a type of square built on a thin cookie crust at the bottom. So to make platz from a dough “as if you would make a tart” in my mind should imply a thin pastry dough, so not unlike modern pasta. 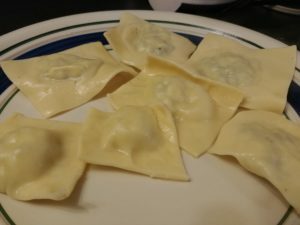 It then makes sense that if you’re making the thin dough, and putting a ball of filling on it, then forming it into a dumpling and pressing the edges together it’s not unlike the modern ravioli. This one didn’t work as well as planned as we were still learning how to use our new pastry roller, but it was still really tasty. The cheese ravioli worked out the best, the chicken ones were a bit dry. What fun. I am currently on a ravioli-like exploration myself. I discovered mantu (manty) while in Afghanistan a few months ago. This is a traditional Ubek dish that is also popular in Afghanistan and something similar shows up in Turkish cuisine (best airplane food ever). 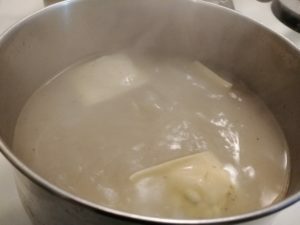 Siberian pelmeni are also related (my recipe is from an immigrant to Canada). Then there are all the variants of peteha/pierogi. So far, my best success has been with a recipe passed down from the great-grandmother of my first apprentice. Even my daughter liked that one and she is notoriously unadventurous. I also have her baba’s recipe, but haven’t tried it yet. The hardest part has been to dig out documentation.